Terrorists must never be allowed to destroy centuries of peaceful co-existence of Muslims and Christians in the Middle East region, the Vatican envoy has told a special session of the UN Security Council. "Too many individual citizens and groups have suffered and continue to suffer death and all forms of violence and discrimination because of their religion, ethnicity or political beliefs," said Archbishop Bernardito Auza. 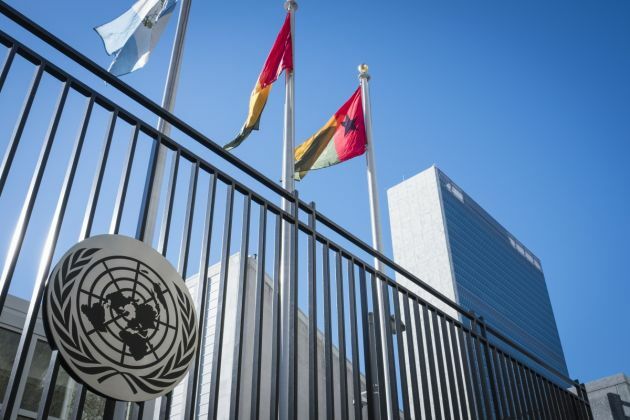 The Holy See's U.N. representative said April 14, "In the Middle East, in particular, terrorists must never be allowed to destroy centuries of peaceful co-existence of Muslims and Christians in the region." The archbishop is the apostolic nuncio leading the Holy See's Permanent Observer Mission to the United Nations, and spoke in the Security Council's open debate on threats to international peace and security. Any long-term solution to foil violent extremism and terror must consider the importance of sacrosanct human dignity and rights, irrespective of race, religion, political belief and difference. Archbishop Auza said violent extremism does not know any border. "Recent terror activities in Lahore, Beirut, Paris, Brussels, Aden, and before that Moscow, Barcelona, London, New York and whole regions in Syria, Iraq, Nigeria, Kenya and Somalia illustrate that fundamentalist terror is a transnational phenomenon," he said. The archbishop explained the terrorists show a total disregard for civilian immunity, killing and maiming women, children, the elderly and the handicapped, and "commit unspeakable crimes against women and girls." Bearing the brunt of their brutality are religious and ethnic minority groups. "The utter barbarity of their behaviour and crimes leaves us dismayed and asking how the human heart can plan and carry out such horrible acts," said Auza. He noted the 30,000 foreign fighters from 100 U.N. member states who have entered Islamic State-controlled territory. "Once trained and completely indoctrinated in the most warped and violent ideologies, they travel to sow terror in other countries," he said. "No one of whatever religion or culture must ever be allowed to carry out acts of violence and oppression in the name of that religion or culture or under whatever pretext," said the papal envoy. Terrorism is "a fundamental threat to our common humanity," said the archbishop noting that the fight against it needs "a shared commitment from all nations and people of good will." He said that using the legal tools and resources together to stop citizens becoming foreign terrorist fighters, governments should engage with civil society to tackle at risk communities from radicalization and recruitment and to attain their social integration. The papal representative urged engagement to end the internet recruiting new supporters to terrorist groups and an end to internet funding for these groups. The Security Council needs to have harsh penalties against arms suppliers. "Collaboration with terror groups, whether for profit or for ideological complicity, must be outlawed. Member states that abet violent extremism or shelter terror groups must be rigorously challenged by this Council," said Auza.